Rogue Frameworks Archives - Art Matters! I recently had the opportunity to show a large collection of my photography at the Rogue Valley Manor (October 2015). Since the manor isn’t really open to the public, I’m setting these pieces up in the frame shop and hosting an open house. ​Please join me Saturday November 14th from 4 – 6 pm. Wine & light hors d’oeuvres will be served. Each image is spontaneous capture of a brief point in space and time, created during a single opening of the camera shutter. View all Rogue Frameworks Ashland, Oregon 97520 - Blog's posts. I always enjoy framing things that have to do with my favorite band. Here’s a limited edition poster and ticket stub from their fall tour opener at Matthew Knight Arena in Eugene that recently came into the shop. For this project I used two layers of Crescent Select conservation matboard–with a second opening for the ticket stub–and 99% UV blocking conservation glass to protect the items. The dark brown frame–one of our value mouldings–is 1 1/4″ wide and 1″ deep, and has a slight wood grain pattern. Custom framing’s a great way to showcase three dimensional objects. Here’s a small shadowbox that I put together for Halloween/Day of the Dead featuring a bottle of Rogue Dead Guy Ale. View all Rogue Frameworks - Custom Frame Shop & Gallery - Ashland, Oregon 97520 - Blog's posts. Another fun music print that came into the shop recently. For this piece I used two layers of Crescent Select matboard, to reflect the colors in the print, along with a high-gloss, yellow frame from Roma Moulding®. Their Lavo Collection comes in a variety of fun profiles and colors, and really looks great on prints like this. The extra space on the bottom is to show the edition information and embossed seal on the print. Finished with Conservation Clear® glass which blocks 99% of harmful UV light to help minimize fading. Photographed with reflective glazing installed and protective cardboard corners. Two pieces we recently framed for Andy’s exhibit at Belle Fiore Winery. His art will be featured through the month of July, with an artists reception on Friday, July 11 (5–8pm) and Saturday, July 12 (12-4pm). We could swim it if we tried. . .
Limited edition screen print, Once A Lizard, by David Welker. For this project I used two, solid-core, Ragmats from Crescent; a dark green for the bottom mat and a neutral tan for the top layer. These 100% cotton mats feature the same color throughout and are the top of the line as far as preservation goes. The frame, from Roma Moulding®, is 1 inch wide with a scooped profile that draws your eye into the artwork. The natural stain mimics the trees in the print. This piece was finished with Museum Glass® for the ultimate in protection and clarity. Visit www.davidwelker.com for more cool artwork. Photographed with glazing in place, so there is some minor reflection. I was honored to frame this front page article from our local newspaper, the Ashland Daily Tidings. Newspapers present some inherent problems as they’re not really designed to last. The paper is very thin and extremely acidic (prone to yellowing) so special care must be taken when framing something like this; done properly though, they can become a memento that will look great for years. The first step was a spritz of de-acidification spray to the paper. Each section was then trimmed and mounted to a piece of black, acid-free, foamboard. The dark background helps to minimize text on the opposite side of the page bleeding through. Two layers of conservation-grade, solid-core, mats were used to add some depth to the piece and highlight only the relevant sections of the paper. Museum glass® was used for the best in clarity and protection while a simple, black, wood frame from Roma Moulding® finished the job. Photographed with glass in place. This panoramic print was photographed at the University of Oregon’s Autzen Stadium on October 31st, 2009 by James Blakeway. The Ducks defeated USC in front of 59,592 fanes, the largest crowd to ever witness a football game in the State of Oregon. For this project I used two sheets of Crescent Select alpha cellulose conservation matboard. Crescent has designated mats from this line that coincide with the colors of major college and professional teams. The frame is 1 1/4″ wide matte black wood for a simple and classy look that fits well in a corporate environment. Custom framing is a great way to commemorate events and display collectibles. Here’s a small piece I created out of a playbill and tickets from Ashland’s own Oregon Shakespeare Festival. These particular items are from shows I saw with my mom last summer on her annual visit. Using the design software with my computerized mat cutter, I created a separate opening for each item: the playbill and both tickets. Next, I adjusted the angle of the ticket windows, then merged them into a single opening. Finally, I centered the openings and set the borders. I used two sheets of alpha-cellulose conservation matboard from Crescent. The top mat is a high-gloss black (similar to the playbill cover) and the bottom mat is a deep red (similar to the the color on the tickets). Both mats have a solid black core which helps to maintain harmony within the design. To finish the look I used a deep red cap moulding from Larson-Juhl with a woodtone. This frame had the depth I needed to fit the entire playbill (strips of acid free foamboard were used to securely hold the playbill behind the mat). For glazing, I used conservation reflection control acrylic from TrueVue®. This cuts glare, helps protect the light-sensitive tickets and is virtually unbreakable (great for items the need to be shipped). 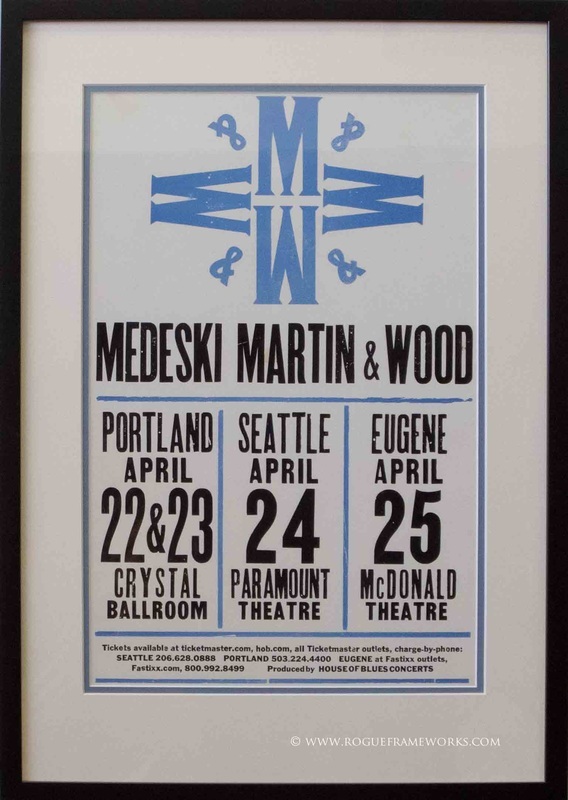 One of the first things I framed for myself was this poster from a 2002 Medeski Martin & Wood show in Eugene. The band was out in the lobby after the show signing copies of their recent CD, Uninvisible, and we were near the end of the line when I noticed a guy in a headset holding a stack of posters. “Sure,” he said and handed one to me and to a few others in line. He seemed glad to have them out of his hands. Each member of the band was extremely personable and I had them sign a copy of their new disc for me* (I probably should have had them sign the poster as well). The next day I adhered the poster to the wall with some of that putty that’s supposed to hold up posters and pictures. The putty failed after a few weeks and continued to fail as the summer heat intensified, no matter how much I used. So I switched to thumbtacks. At this point all corners of this poster were stained from putty or dented from falling off the wall, what’s a few thumbtack holes? At least It’ll stay on the wall. After years tacked to my wall I decided this poster was too cool to leave in it’s current state, so I framed it. The double matting covers most of the corner damage, will protect the paper from further damage, and compliments the color scheme. Conservation glass was used to prevent fading due to UV light. Now it’s protected and looks great no matter where it is. *and DJ P Love; he played with them the entire show and appeared on a couple tracks.